Yes, it’s true. The Afternoon Blouse can be made in an afternoon! This represents me and my sewing really getting into the 21st Century. Not only did I buy the pattern to download (from a designer New Zealand), but I have also had to patch the printed pages together and then trace the pattern. Thinking that process might take longer than the blouse-making afternoon, I was surprised how quick that all was. And of course, if I make myself another one, I have the pattern ready to go. Alternatively, I could trace other sizes for friends. I also researched a little online, including looking at Pinterest to study other people’s interpretations, and it was a picture of a version with piping that inspired me to add the ric-rac. I also read some pattern reviews and identified that a marker for the point where the facings and fronts all meet would be of use. So I measured and marked every piece before cutting out, and it worked a treat. The join was pretty much right first time. I highly recommend other people to do that if using this pattern. The instructions do tell you where the mark should be. I wanted something quite plain. I have a lot of patterned tops and therefore there are limits of what will go with what. And with a basically maroon or blue wardrobe, the gold colour should go with either. The fabric was my retail therapy during the sewing course at Guthrie-Ghani last week, along with the ric-rac, which I have purchased from there before. I bought the button in John Lewis this morning. I have made whole outfits for £10 before now. This is one of my more expensive makes. What with £7 for the pattern, about £20 for the fabric, and then the ric-rac and button, it must have cost me nearly £30. But if I really do want to think like that, then I can start to discount the pattern if I make another one, and it only takes 3 hours, so the time part of the cost is quite small. So thanks to JenniferLaurenVintage.com for this. I like it. It’s the sort of pattern that I can have some fun with! 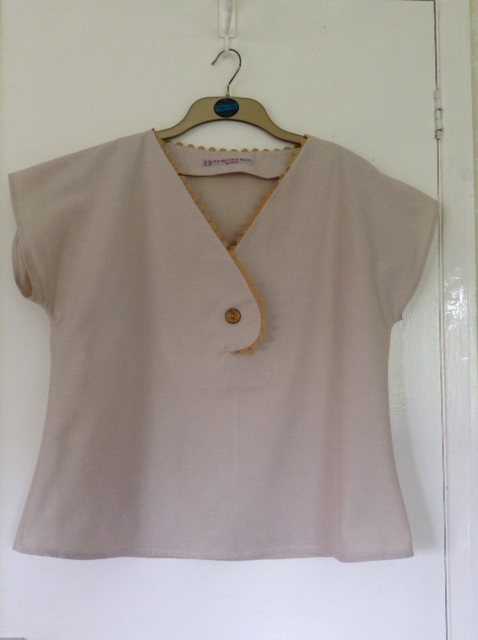 This entry was posted on June 22, 2014 by ann hebden in Fashion, Sewing, Tops and tagged Afternoon blouse, Fashion, Handmade, Sewing, Tps.